Phoebe Henninger welcomed the news that she had been accepted to the University of Pennsylvania with gleeful gratification. Then her nerves delivered their own news. Phoebe is a home-schooled student who took an extended break after high school - of eight years - before enrolling in community college. She was ready for a bigger challenge like Penn but was left with a feeling of imposter syndrome. "When you're out of academia for a while you feel like you're not good enough," said Phoebe, a senior political science major. "There's a lot of insecurity in coping with the academic demands of an Ivy League school, and you're not sure how you're going to match up." 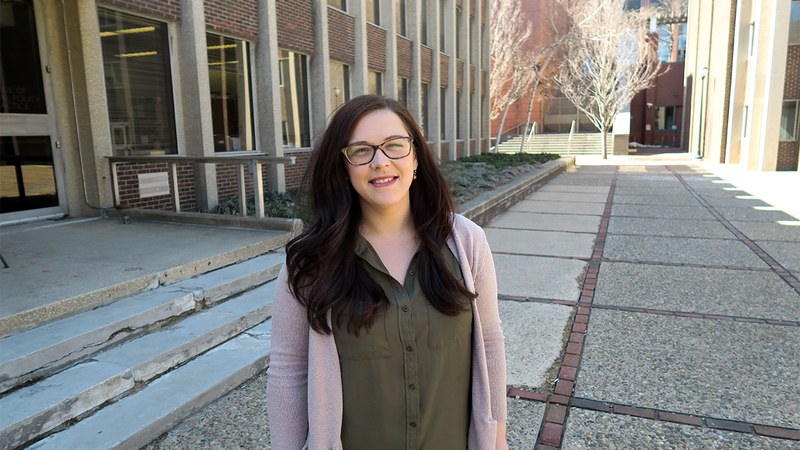 Phoebe's concerns were quickly assuaged once she began taking courses in Penn's College of Liberal and Professional Studies (LPS) Bachelor of Arts program. The program caters to a wide range of non-traditional students - like Phoebe - who are already in the midst of their professional and family lives. The LPS Bachelor of Arts aims to meet the unique needs of those students who are pursuing a degree in higher education. For Phoebe, she quickly discovered an accommodating support system and an abundance of career resources to ease her transition. "Luckily, I had people here at Penn to walk me through the process," Phoebe said. "I started working with my mentors, and it built up my confidence. I've now been accepted to PhD programs, and I never would've achieved that without great mentorship." The LPS Bachelor of Arts cultivates a diverse learning experience with many students sharing similar community college backgrounds. Phoebe's experience was even further enhanced by a number of professional opportunities that aligned with her interest in conducting research. "I wasn't aware of all the resources and all the doors Penn could open for me," Phoebe said. "I got to do some very exciting and meaningful research. There was no better place for that than Penn." Phoebe's experience included working as a research assistant in the Political Science Department at Penn, interning at the Democratic National Convention for NBC News, political polling at Social Science Research Solutions (SSRS) and access to a seemingly endless supply of compelling guest speakers and people in the political world. "That's why I came to Penn," she said. "If you want to learn something, there's probably a course for it. And if you want to extend that learning into a larger opportunity, Penn is unmatched for that." Last fall Phoebe unlocked another reward in the Bread Upon the Waters Scholarship, a competitive, merit-based honor awarded to a very select group of female students over age 30. "It's been a huge relief; I don't have to worry about financial concerns now," Phoebe said. "And there's this sisterhood; we occasionally get together for dinners or to hear guest speakers." This spring, her LPS Bachelor of Arts experience will culminate with a degree in American politics followed by a PhD pursuit. As you probably guessed, Penn sits comfortably near the top of her list, with the University of Michigan also in the running. Phoebe's quick to acknowledge she couldn't have reached the heights of her success without Penn's LPS Bachelor of Arts program. "I'm taking with me a lot of skills I learned, especially in research, and these networks of people in my field," Phoebe said. "My experience as a research assistant has been the highlight of my undergrad career." Prospective students are invited to get a taste of the program at the College of Liberal and Professional Studies Bachelor of Arts Open House on Saturday, April 7, from 11 a.m.-2 p.m. For more information and student testimonials, visit The College of Liberal and Professional Studies.